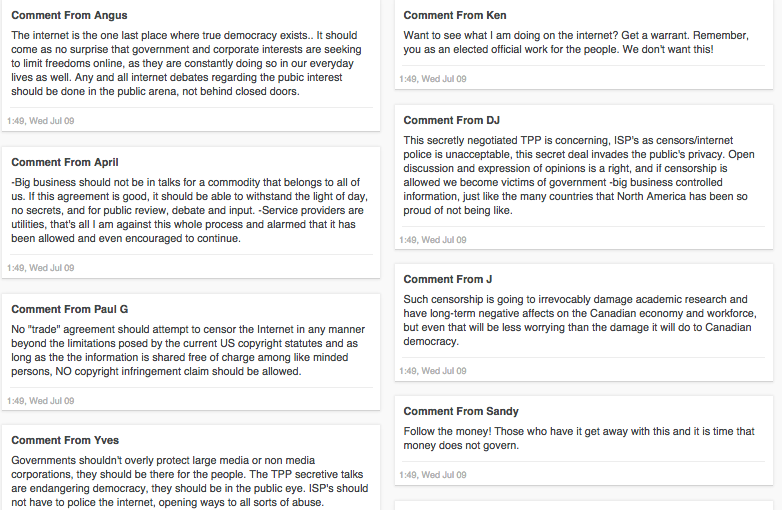 Our Internet Voice Tool is an open web form that gives Internet users the opportunity to let decision-makers (particularly those responsible for the TPP) and the world know what kind of digital future they want. The design of the tool has at times allowed individuals to endorse a pre-written statement28 but also always provided the opportunity to write personalized comments. The option for personalized comments allows individuals to speak freely about their concerns, giving them a chance to express themselves in their own words. We analyzed key words, phrases and themes – along with conceptual links and relationships between words and phrases – from the comments to help inform the questions in our drag-and-drop tool, as well as our policy recommendations. 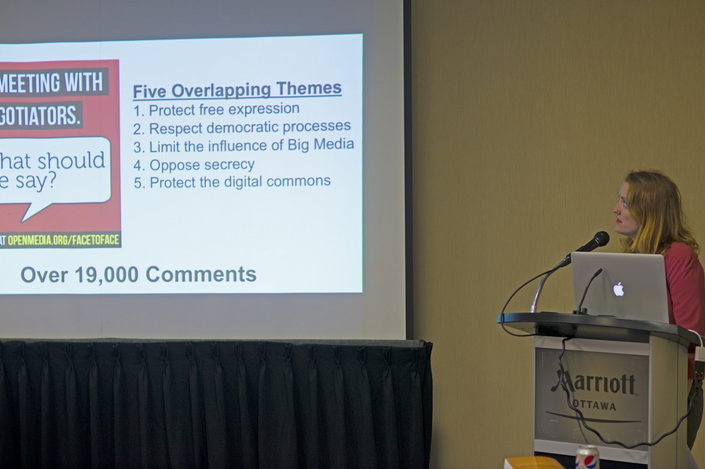 For the July 2014 round of TPP negotiations in Ottawa, Canada, OpenMedia sent Reilly Yeo, our Community Engagement Specialist, to deliver comments from nearly 20,000 individuals [Image 8].36 In a brief presentation to negotiators, Yeo drew attention to past engagement strategies by OpenMedia and the Fair Deal coalition, and directly delivered comments touching on five key themes emerging from citizen input: protecting free expression, respecting the democratic process, limiting the influence of Big Media, opposing secrecy and protecting the digital commons.